Hold on. This article is going to take you around the world and back, but well worth the ride! As most of you know, I am between girlfriends. It is very easy to find dates, but impossible to find someone who meets most of my criteria. Thanks to my copywriting skills, I have had to turn off my online dating account. My inbox has been overrun with potential matches. I have a full time career. I can’t make dating another. Without getting into the copy, I’ll let you into one copywriting trick that works great for any copy job. It’s the use of “You” versus “I”. Reading through all of my potential match’s profiles, there is an overwhelming use of “I”. Too many I, I, I’s! The word “I” was left out of my profile. I wrote with “you” in mind. One change in words makes a big difference. You must put yourself in the place of your prospect in order to win them over. To win a woman’s heart, you must think like a woman. Women have their own language men don’t understand. For instance, a woman expects you to open a door, pick up the tab, and walk on the street side of the sidewalk and much, much more. You’ll never catch fish thinking like a frog. Being on the metro side and a marketer, I think I’ve got this down fairly well. There’s even a book called the Five Love Languages. By knowing your partner’s or potential partner’s love language, you can focus on what makes them happy. I care nothing about gifts, but quality time is a biggie for me. Part of quality time involves experiences. Last week I was in Las Vegas for the International Pizza Expo. This was a trip chock full of experiences. My buddies, Edward, Mark and Rich came out for some poker, fine dining and partying. Came in fifth in my first poker tournament, did stand up comedy on the strip, improvised a song on the strip with a street musician, was in an IHOP commercial, saw a great comedian, saw David Copperfield, played an incredibly funny practical joke on my friend and almost got in a fight with a guy from Scotland. 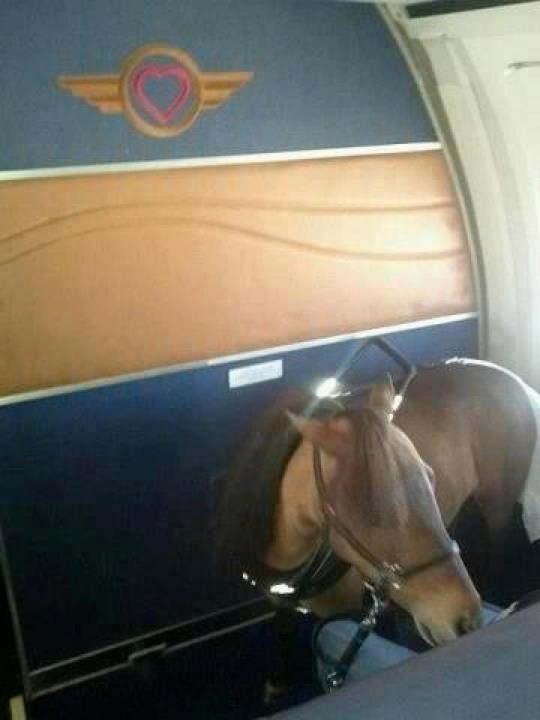 And let me not forget drinks with a Southwest flight attendant and her flight mechanic husband who shared a picture of a Seeing Eye horse on one of her flights (pic below). Too bad I didn’t have a camera crew. It would have made for a new version of The Hangover. I am available for bachelor parties and guy trips should you need to hire a “life of the party”. Experiences are not limited to you. Your catering clients expect their own experiences. The catering experience is more important than the food. One type of experience is the event itself. One of my new members, Ben Eaddy, is the master of experiences. He is able to command the highest prices in his market for crawfish boils, barbecues and other specialty catering events by the experience he creates. Another aspect to the experience is how the catering customer and prospect are treated. What happens when I pick up the phone to call? (This will be discussed in length in my next newsletter). Do I get a busy signal? Does someone take my contact information, or am I asked to call the salesperson? Do you show up on time? Is my order complete? Is it set up nicely? Is the delivery person well dressed, friendly and helpful? Is there enough food? Mark Rogers, a new member, just sent me an email about a hospital that replied to a direct mail piece we worked on together. Hospitals can be lucrative catering clients. The hospital wanted 30 day terms, but his vendors only gave him 14 day terms. He wanted to know what he should do. # 1: A client or prospect doesn’t give a flip about you, your terms or what you have to deal with. They only care about themselves. Always put yourself in their shoes. (Refer back to the “you” versus “I” section above). #2: If you average it out, the credit card companies take 2.75% of the sale. You could afford to borrow the money and wait six months to get paid, and you’d break even on your cost of funds. At any given time while I owned Corky’s, we had an outstanding accounts receivable balance of $25,000. On a million a year in sales, that’s not bad. I wish it had been $100,000 on four million in sales. It’s a cost of doing business. It tells the world you are a business, not a mom and pop operator. Offering credit to large corporations made the Corky’s experience that much better than working with our competitors. For the record, there are lots of little things that go into the “experience”. Ask and your customers and prospects will tell you. What can you change in your catering “experience” today that let’s your customers and prospects know you feel their pain and are the only caterer to solve it? Answer that, and your catering success will follow.